A cosmic phenomenon involving pockets of hot gas in space which appear not to cool down has been puzzling astronomers for three decades. Now new research by Dr Christian Kaiser at the University of Southampton and Professor Marcus Bruggen of the International University Bremen, Germany, shows that the energy of the hot gas is actually replenished by jets emitted by black holes. Their research, which is published in the science journal Nature (Volume 418, 18 July 2002) and an image from which is featured on the journal's front cover, involved extensive computer simulations of the turbulent break-up of jets in the hot gas of galaxy clusters. Galaxy clusters are created when a large cloud of gas collapses under its own gravity, and each can contain around 1,000 galaxies, such as our own Milky Way, and a large amount of very hot, leftover gas. This gas radiates X-rays, which is how we can detect it, and these X-ray emissions should lead to the hot gas cooling down within a few billion years to form stars in even more galaxies. However this is not the case. In their study Christian Kaiser and Marcus Bruggen found that the key to this lies in jets of gas emitted from massive black holes that lie at the centre of so-called 'active' galaxies within many galaxy clusters. The black holes swallow up any gas coming close to them and liberate enormous amounts of energy in the process. This energy drives very narrow outflows of gas at velocities close to the speed of light, the 'jets'. These jets can carry an amount of energy equivalent to 10 billion supernovae, the violent explosions at the end of the life of a massive star. This is more than enough to re-heat the hot gas in galaxy clusters. "Our results indicate that the black holes in active galaxies behave like cosmic thermostats," says Christian Kaiser. 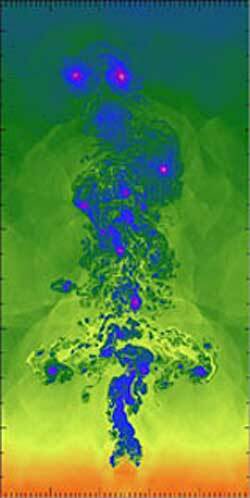 "The hot gas in a galaxy cluster cools down to low temperatures and flows to the cluster centre. There the black hole is waiting. It swallows some of the cold gas and the energy from this process drives jets into the cluster gas further out. This heats the remaining gas and drives it away from the cluster centre. Thus the black hole runs out of fuel and shuts down. After the gas has cooled down once more, the whole cycle starts again." The researchers employed the most advanced software currently available for the simulation of fluid flows on the 128-processor parallel supercomputer of the UK Astrophysical Fluids Facility at the University of Leicester. They are currently continuing their investigations by extending their computer simulations and hope to pin down the exact details of this 'cosmic thermostat' and thereby solve one long-standing mystery in astronomy. The University of Southampton is a leading UK teaching and research institution with a global reputation for leading-edge research and scholarship. The University, which celebrates its Golden Jubilee in 2002, has 20,000 students and over 4,500 staff and plays an important role in the City of Southampton. Its annual turnover is in the region of �215 million. For a limited time only, preorder your Apollo 15 DVDs at a special discount price. Two- and six-disc editions of this unique DVD are coming soon.